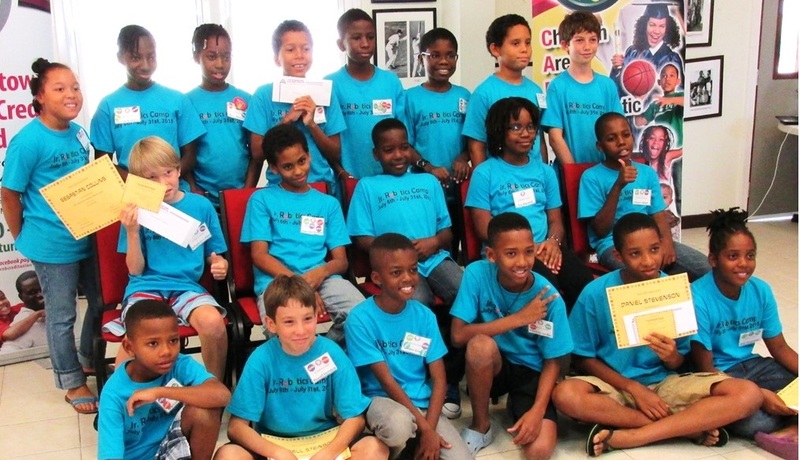 The 2015 inaugural four-week Junior Robotics Camp organised by the Caribbean Science Foundation (CSF) Volunteers for Barbados has been hailed as a success. The camp was conducted over the period July 6-31, 2015 at the facilities of the UWI Barbados. Twenty-one eager and excited students between the ages of 9 and 12 participated in the camp. The final Showcase of the robots was held on Friday July 31 at the 3W’s Oval on the UWI campus in an event that was open to the public. Over 50 people were in attendance, including the parents of the campers. Interim Executive Director of the CSF Professor Cardinal Warde said the camp was a “grassroots effort” by a group of dedicated Barbadians (and one Grenadian) who want to facilitate Barbados’ efforts in harnessing STEM (Science, Technology, Engineering and Mathematics) for economic development. The Camp was offered in partnership with UWI Barbados which provided the use of its facilities. Sponsors of the camp included the Barbados Ministry of Labor, Social Security and Human Resource Development, and the City of Bridgetown Credit Union.A key objective of the camp was to engage the minds of the children in fun-filled activities where they collaborated in teams to design and operate simple and then more complex robots. All the movements of the robots were run by software formulated and programmed by the students. “By all measures, it was a tremendous success. It far exceeded my expectations for a pilot programme,” Professor Warde told parents and students at a closing ceremony and exhibition. “The students turned out to be faster learners than the facilitators had expected. These students are the most excited bunch I have seen in a while,” he remarked. The camp was carefully supervised by a team of coaches. The students were introduced to basic engineering and technology concepts. They were taught to design and operate simple devices such as catapults made from sticks and rubber bands and graduated to assembling mobile transportation vehicles and writing the software programming for their functionality to move and lift objects. “While no previous experience in robotics was required of the students, this pilot targeted children who are passionately interested in STEM and enjoy hands-on work,” said CSF Assistant Director Lois Oliver. The junior robotics camp is consistent with the CSF’s primary goals of: (1) helping to increase the numbers of Caribbean students pursuing advanced degrees in science and engineering, (2) helping to diversify the economies of the region, and (3) helping to stimulate more technology-based entrepreneurship within the region, thereby raising the standard of living of the people. Professor Warde expressed warm appreciation for the support provided by the partners and sponsors, and indicated that the pilot project had laid the groundwork for an expanded 2016 camp.